There are only two ways to pass Voter ID legislation in Nebraska - violate the Constitution, or waste a whole lot of money. Our legislators were elected to solve problems. In a year when we’re facing a nearly $200 million budget shortfall, we need our legislators to make reasonable, evidence-based decisions that will make protect both our elections and our right to vote. 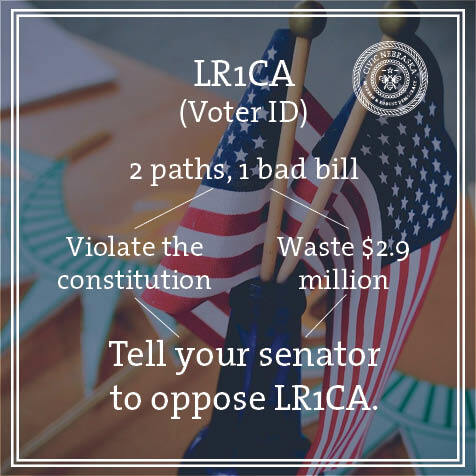 LR1CA, the constitutional amendment requiring Voter ID introduced by Senator Murante and prioritized this year by Senator Larson, is irresponsible, ineffective legislation that will continue to undermine both the state budget and public trust in elections. Voter ID legislation is too expensive. If LR1CA becomes law, our legislature will be required to create and pass some version of voter ID legislation. LB1066, a recent bill representing the likely implementation of Voter ID, carries a $2.9 million setup cost, and an annual cost of at least $750,000.1 Our budget cannot afford this costly legislation. Voter ID legislation unfairly targets rural Nebraska seniors and voters with disabilities. Even if the state issues free IDs, requiring trips to the DMV will create additional barriers for rural Nebraska seniors. In 16 Nebraska counties, the DMV is only open once a month.2 Access to transportation and limited DMV hours pose a significant threat to the right to vote for senior citizens in Nebraska and Nebraskans with disabilities. Experiences in other states prove that requiring photo ID, even if the state provides ID, disenfranchises voters. And, let’s not forget, there were zero cases of voter impersonation fraud in Nebraska during the 2016 elections. This is irresponsible, ineffective legislation in response to a problem that doesn’t exist. Call your senator and tell them to oppose LR1CA. Legislative Fiscal Office, February 2, 2018. “Wisconsin is Systematically Failing to Provide the Photo IDs Required to Vote,” The Nation. September 29, 2016. “Voters Turned Away Because of Texas Photo ID Law,” Brennan Center for Justice. October 28, 2014.